Decisions don’t come much bigger. Decisions of this kind shape fortunes of managers. Get them right and a team’s potential can be unlocked. Get it wrong and the consequences are huge. It is necessary to apply that context to the situation surrounding Sergio Aguero, Pep Guardiola and Manchester City. The best forward in the division — and one of the best players ever in the Premier League — has suddenly found himself dispensable. It’s a huge call on Guardiola’s behalf. Aguero has been the emblem of this era at City, a man whose goals propelled them to two titles. There hasn’t been a better penalty-box striker in the Premier League, as his unsurpassed average of a goal every 109 minutes illustrates. Yet here he is, no longer guaranteed to be the focal point of Guardiola’s team. 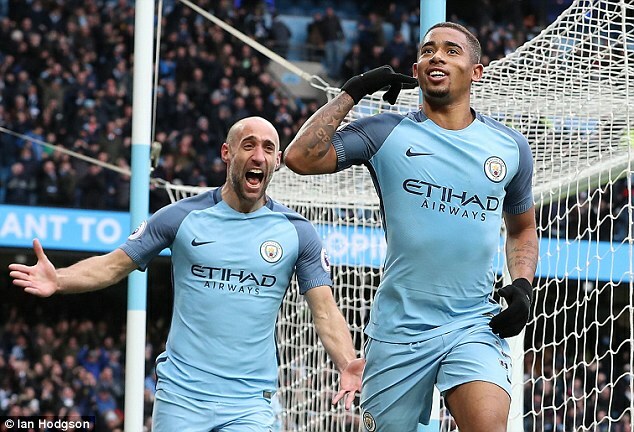 The buzz around Gabriel Jesus, who looks as if he will be a superstar, is understandable but how can it be that a 19-year-old whose experience of English football amounts to 278 minutes has leapt ahead of Aguero? Well, for starters, Guardiola said last week his ‘tracking back is really good’. He’d never say the same about Aguero and there is always the perception that the Argentina international is not his manager’s kind of striker. I’ve thought about similar situations when managers have made big calls on other goal-scoring sensations, such as when Kevin Keegan stood on the steps of St James’ Park in January 1995 to explain to fans why he’d sold Andy Cole to Manchester United. Keegan waited a few months but eventually bought Les Ferdinand to replace Cole. Ferdinand was outstanding, he became the PFA Player of the Year and Newcastle, really, should have become champions. 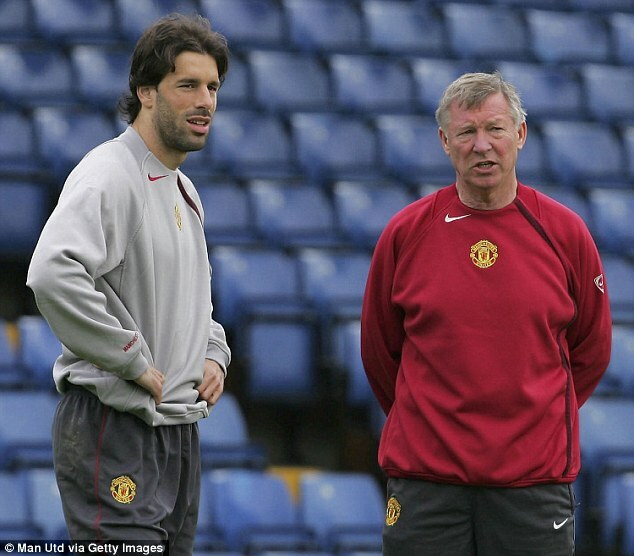 The best example, perhaps, revolves around Sir Alex Ferguson and Ruud van Nistelrooy in 2006 when the Holland striker was off-loaded to Real Madrid without Ferguson flinching. At the time, I couldn’t believe what Ferguson had done. United hadn’t been champions for three years and it looked to be a deal that could haunt him as Van Nistelrooy had scored 70 goals in that period and his back-up striker, Louis Saha, was not in the same class. What happened next vindicated the decision. Not only did United win the title for the next three seasons, they also added the Champions League in 2008. Significantly, it also allowed the young talents, Cristiano Ronaldo and Wayne Rooney, to step forward. Does Guardiola have this in mind for his own young guns Jesus, Leroy Sane and Raheem Sterling? What made Ferguson so special was not just his ability to make big decisions, but also the fact he invariably made the right ones. Managers can make themselves look strong by selling or dropping players, but if the move doesn’t work, the choice looks flawed. Take Nicolas Anelka and Liverpool in 2002 after he’d had a brilliant loan spell. The clamour to make the deal permanent was huge but Gerard Houllier had reservations and signed El Hadji Diouf instead. We had finished runners-up to Arsenal in 2002; 12 months later we dropped to fifth. We aren’t yet at the stage where Aguero is on his way out of City. There is even the possibility he could be restored to the starting line-up for Monday’s trip to Bournemouth, given how Guardiola has tinkered with his team. But you can’t help feel it is pointing that way, and the famous spine that won five trophies is being phased out. Claudio Bravo has taken over from Joe Hart, John Stones is the future in defence ahead of Vincent Kompany, and Yaya Toure’s time in Manchester will soon be over. 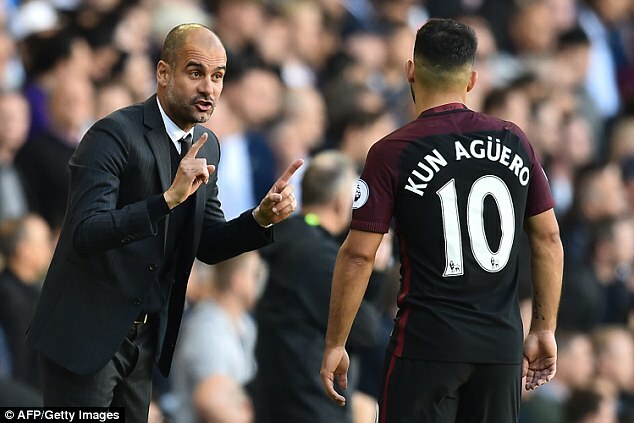 There will be no public admission from Guardiola that Aguero is heading the same way and both are being diplomatic when speaking, with Aguero insisting he is happy that his contract runs for another three years. 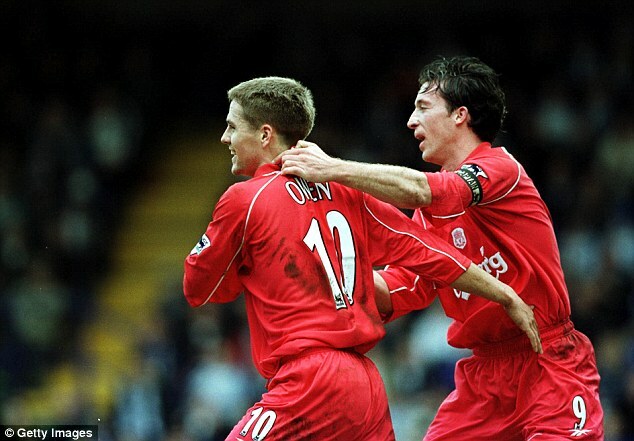 But I can see a parallel with Aguero and Jesus for how it was for Robbie Fowler when Michael Owen emerged at Liverpool in the late 1990s. You knew when Michael came through that there would be an impact. Once Houllier brought Emile Heskey in and Michael had won the Ballon d’Or in 2001, the writing was on the wall for Robbie and he moved to Leeds. The point is, Michael and Robbie never looked like a partnership; nor do Aguero and Jesus. Guardiola, remember, never played with a front two at Barcelona and only did it very rarely during his time at Bayern Munich, so I cannot see him going down that route in Manchester. Besides, how would you accommodate them? To do so, he would have to alter his system. Jesus could play on the left but his most productive time in Brazil with Palmeiras was in a central area. Sterling and Sane have thrived on the flanks, while Kevin De Bruyne and David Silva have sparkled playing as ‘false eights’, the position just in front of midfield and behind the strikers. I said at this time last year that of all the players Guardiola would inherit, Silva and Aguero had questions to answer as you would not associate them with the high-pressing, high-intensity style their manager favours. 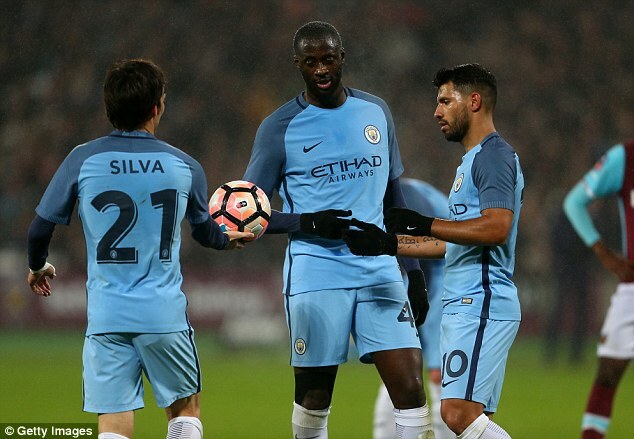 Silva, though, has reinvented himself in midfield. Aguero’s goals-to-games ratio has been good, scoring 18 times in 26 matches, but he hasn’t hit the target in any of the fixtures against sides around them in the table and one of Guardiola’s complaints has been about City being ‘not good enough in the boxes’. Even so, it would still be a huge call to cut ties with Aguero. Perhaps City have looked at what happened in Italy last summer, when Napoli sold Gonzalo Higuain for £75million to Juventus. He was 28 when that deal was completed, the same age as Aguero. Maybe they would cash in and turn their attentions to buying the 27-year-old Pierre-Emerick Aubameyang from Borussia Dortmund; it’s obvious Guardiola wants a hard-running player to fit into his system. Yet, just say Aguero goes and City don’t progress? What happens if they don’t win the Premier League next year or they don’t make it deep into the Champions League and Aguero is scoring elsewhere? One thing happens: the spotlight shines even more intensely on Guardiola. He’s already made one big call, and replacing Hart with Bravo hasn’t worked. If his next big call is to sanction the departure of Aguero, Guardiola must have the right solution. If he doesn’t, he will have to brace himself. The only thing to follow will be serious flak. One of the great modern careers will be over at the end of this season — but the timing of the announcement has taken everyone by surprise. After winning 18 major honours, Philipp Lahm has brought forward the date of his retirement to this May and not 2018, as he originally intended. He told me when I interviewed him last spring that he ‘wanted to decide when the time was right’ and there is no question he has done that. Lahm has said he doesn’t want to pursue a role off the field yet with Bayern Munich and it could be that he just wants to get away from the relentless nature of football and the pressure that is involved every day at a top club. When I asked him about coming out of international retirement to play for Germany at Euro 2016, he laughed, shook his head and said he wanted his summer to be about ‘beer and barbecues!’ There comes a point when enough is enough. One thing we can say for sure is that Lahm’s place among the legends is secure. He started out as full back but had the class and intelligence to become an outstanding holding midfielder. Ask me to name the three teams I think will be relegated and one club immediately springs to mind: Leicester City. I wrote before Christmas how Leicester could let their extraordinary story end with them being relegated. Their form has been awful since the turn of the year and I couldn’t believe how bad they were against Manchester United. Something has to change if they are not going to plummet from the Champions League to the Championship, but I was glad to see that the club’s owners issued a statement this week to say one thing that won’t be changing is the manager. Claudio Ranieri has been under siege but I have been dismayed about the noises that have come from the dressing room, with one of the complaints being that he has been tinkering with systems too much. Seriously? Have the players ever thought that he has been desperately trying to find solutions because their level of performance has been so bad? Have they actually stopped to think for a minute what they achieved because of him last season? Leicester’s squad should thank Ranieri every day for the rest of their lives for what he masterminded, instead of playing in a way that has led to his position being questioned. They owe it to him to turn things around and change results before it is too late.